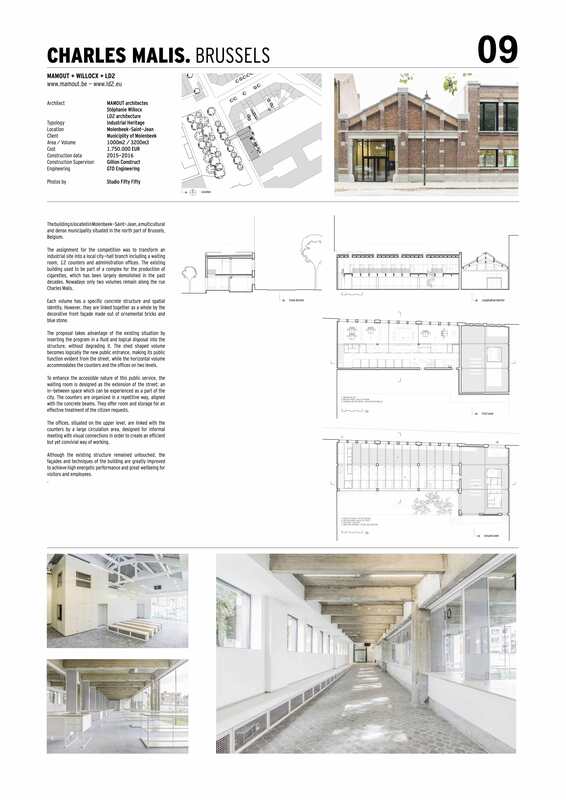 The building is located in Molenbeek-Saint-Jean, a multicultural and dense municipality situated in the north part of Brussels, Belgium. The assignment for the competition was to transform an industrial site into a local city-hall branch including a waitingroom, 12 counters and administration of ces. The existing building used to be part of a complex for the production ofcigarettes, which has been largely demolished in the past decades. Nowadays only two volumes remain along the rue Charles Malis. Each volume has a speci c concrete structure and spatialidentity. However, they are linked together as a whole by the decorative front façade made out of ornamental bricks and blue stone. The proposal takes advantage of the existing situation by inserting the program in a uid and logical disposal into thestructure, without degrading it. The shed shaped volume becomes logically the new public entrance, making its public function evident from the street, while the horizontal volumeaccommodates the counters and the of ces on two levels. To enhance the accessible nature of this public service, thewaiting room is designed as the extension of the street; an in-between space which can be experienced as a part of thecity. The counters are organized in a repetitive way, aligned with the concrete beams. They offer room and storage for an effective treatment of the citizen requests. The of ces, situated on the upper level, are linked with thecounters by a large circulation area, designed for informalmeeting with visual connections in order to create an ef cientbut yet convivial way of working. Although the existing structure remained untouched, thefaçades and techniques of the building are greatly improved to achieve high energetic performance and great wellbeing for visitors and employees.